The eye is a marvelous piece of equipment. Working away making adjustments to the image in front of us without us even been aware of it. When we look at a sunset, with the naked eye, we see all parts of the scene in most cases. The iris closes when we look at the setting sun and clouds allowing us to appreciate the fantastic colours. The iris then opens when we lower our gaze and we see the details of the landscape. Yet the limitations of photography over the last 100 years has established the representation of sunsets in photographs and even paintings as silhouettes against a brilliantly lit sky. We accept it without question. Digital photography can change all this. We can now represent a sunset in a picture as we would see it in real life. It means a bit of work afterwards in the computer but its well within the scope of the amateur photographer. 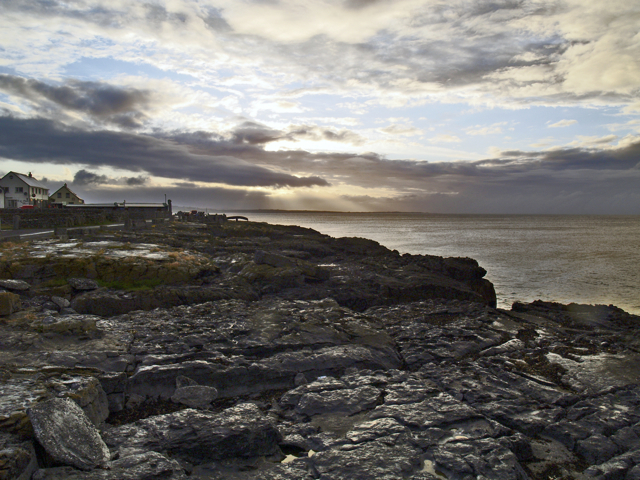 Sunset, Inis Oir (the smallest of the Aran Islands off the coast of County Galway). When photographing a scene which has a very bright part and a very dark part the camera’s automatic exposure control will compromise. For example, the sky will be slightly overexposed and the ground underexposed. If the photo is opened in Photoshop the ‘Highlight/Shadow’ control can correct this and it does a great job. But it can have the ‘digitally altered’ look which is OK most of the time and I suppose is a good ‘quick fix’. This photo had a great sky which was ‘burnt out’ when I adjusted the camera’s exposure to show the details in the foreground. When I reduced the exposure to correctly expose the sky the ground was a black featureless mass. The solution was to take 2 photos at almost the same time. One to correctly expose the sky and the other to correctly expose the ground. Take the 2 correctly exposed bits and fit them together. Simple, if you have Photoshop or similar. Happily, there are loads of inexpensive applications available nowadays, because of the popularity of digital photography, that are capable of doing this. If you give it a try, remember, as you will be a little out repositioning the scene after you adjust for the second shot take more of the scene than you want at the start (wider lens setting) with the intension of cropping back when finished. Sandwich the 2 photos in Photoshop with the white sky photo on top. You can easily select this white sky bit with the magic wand tool. Delete the sky. The sky in the under photo will now be seen. Slide the upper photo around till the horizons match up. A little bit of fiddling around the edges might be needed. P.S. Some of the more sophisticated cameras have a feature called ‘bracketing’. This allows you to specify a range of photos each side of the ‘correct exposure’. With this setting enabled, as you press the shutter the camera takes the photo at the ‘correct exposure’, then will continue to take photos at progressively darker and lighter exposures. Depending on your settings and camera you could have 3, 5 or 7 photos going from light to dark. In many cases this range is sufficient to allow you to have the best of 2 of these photos. The advantage of this is it all happens in 1 or 2 seconds without you having to made adjustments between the shots. This entry was posted in Photography and tagged digital, landscape, photo advice, photo manipulation, photography, photoshop, sunset. Bookmark the permalink. ← Simple, fast, Impressionist Style Painting. The techniques described will be difficult to implement without a tripod, but very often it’s missing. So I basically shoot one shot, but in this case, you must remember one important thing – in digital photography, unlike the film, you should not overexpose the sky. And you must use RAW format, not JPG. All photos published on my blog are made this way. Thank you for your comment. Your photos are excellent, very well planned and executed. My camera is only one small part of my picture making equipment. I would never have a tripod with me and the technique is for people who happen upon a scene, unplanned and have to make the best of the situation. I would have to say, the vast majority of photographs taken today are taken in this manner by all different photographic abilities. Thanking you again, keep up the good work.